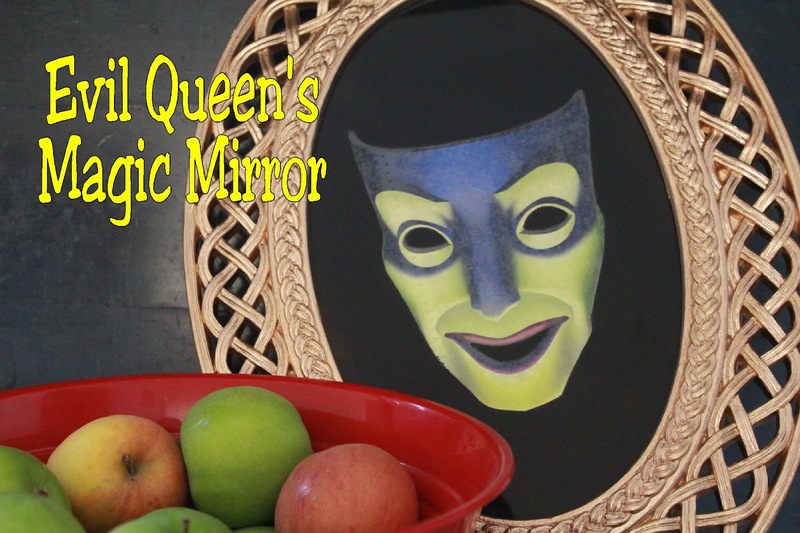 I can not tell you how excited I am about how my Snow White Queen's Magic Mirror turned out. I went rounds in my head with different ideas on how best to do this and I wasn't sure. Even when I found this awesome picture and frame at Goodwill, I bought it not knowing if it would work or not. I'm not sure where the "Before" pictures ended up, but it was a white frame with a picture of flowers in it. So I took the frame apart and spray painted it gold. I found THIS picture and printed it out onto cardstock. I cut it out including the eye and mouth sockets. Then I ran it through my xyron sticker maker with the picture side being the sticky side. I stuck the picture to the back of the glass so the graphic would shine through. Then I spray painted the glass black on top of the picture. I wasn't sure what it would do to the picture, but it held up without a problem. It took a couple coats to get the black perfect. 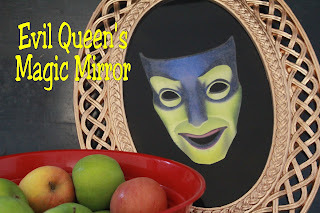 Then I put the whole thing back together for an amazing mirror. It's pretty aweseome since you can see yourself in the glass reflection so it looks like the mirror is there, just faded due to the evil spirit. So cool ..... Thanks so much for joining us at last week's All my Bloggy Friends .... We look forward to seeing what you share this week!